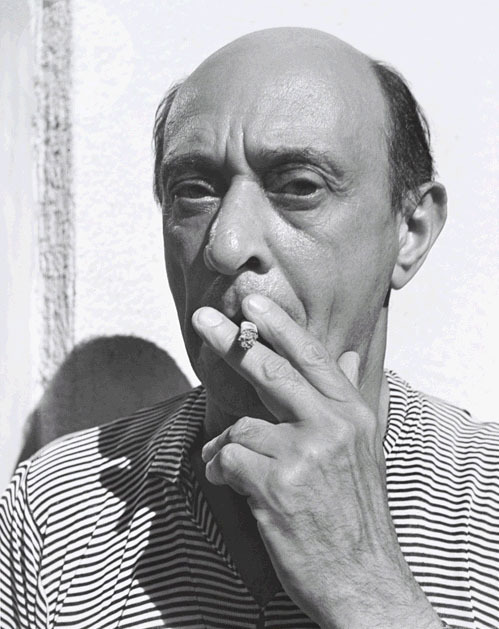 In later letters, Schoenberg would also recall the period as a time of peace and pause, before that age of war and unrest when twentieth century European history seesawed into darkness. 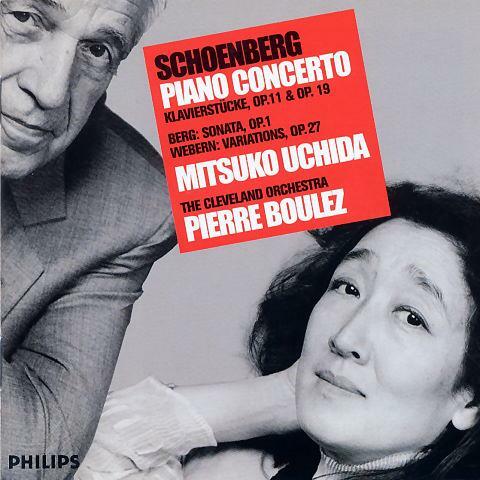 With a view to the composer’s creative life, the pre-war years find Schoenberg undertaking his earliest experiments with atonal composition – listen to the Six Little Piano Pieces of 1911, for instance – and in this respect mark his first soundings into the uncharted depths of the future. But they were also the years in which he experimented most concentratedly with painting. 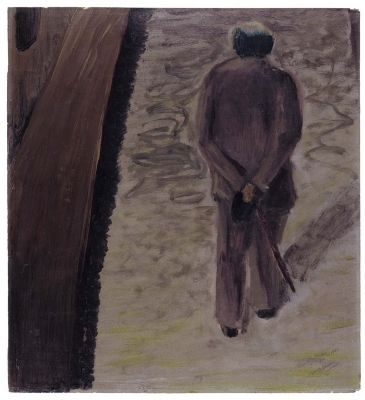 From 1908-1912 Schoenberg produced paintings and sketches of distinctive style. 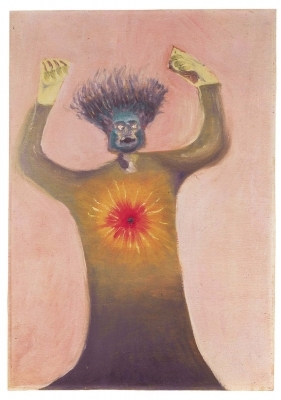 While he was hesitant to consider himself part of an established school of any kind, his work is generally recognized to orbit the Expressionist movement. For a short time, Schoenberg even belonged to Wassily Kandinsky’s Blue Rider (Der Blaue Reiter) group, a circle of friends who held that the ultimate aim of art was to seize and give expression to the spiritual dimensions of experience. 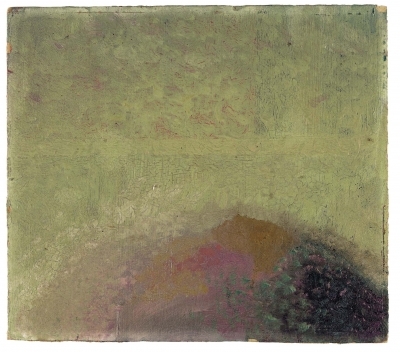 In this way, many of Schoenberg’s paintings aim less to represent the world in its outward semblance than to capture things as they “really” are on the subjective plane: the world refracted through the lens of the inner eye. Consider “Thinking,” the painting immediately above. It’s just one expression of thinking in its most immediate or unconscious sense: the subjective experience of thinking in a manner that’s unmediated by the concepts that ordinarily order, the lines that frequently frame conscious thought. It’s a glimpse of the mind’s eye, the artist’s experience freed from the terms of traditional perspective. 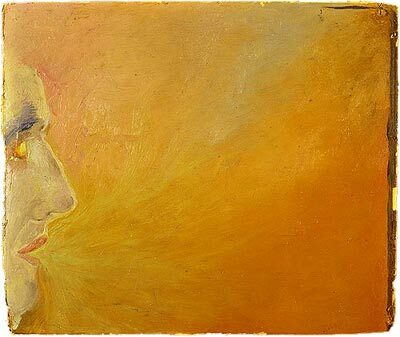 If the perspective in Schoenberg’s paintings feels askew, it’s because artistic expression in the expressionistic mode isn’t meant to capture the world as it outwardly appears to us through our sensory faculties. This orientation, like art itself, is ultimately born of the unconscious. Freed from both the mind-forged manacles of conscious thought and the shackles of sensory perception, the objects of the external world fade. According to Schoenberg’s view of artistic experience, at least, these gazes subsist on a plane of perception where everything is illuminated by the light of the unconscious. They are visions – let’s call them innervisions – beyond the pale of the senses. It isn’t important whether Schoenberg’s conception of artistic perception is wholly accurate; more crucial is the recognition that experience (both conscious and unconscious) is rich and layered, that there are many different ways of perceiving it – and that art is one very real part of it. 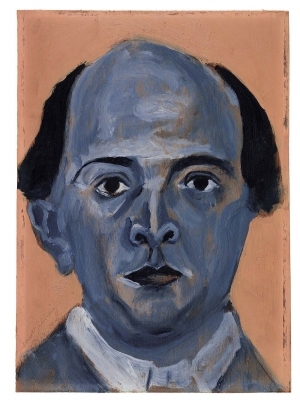 What’s ultimately important is Schoenberg’s belief that the vision of the creative artist isn’t veiled by custom. Instead, one task of his imaginative work is to pierce the fabric of convention – a life of humdrum habit – and to tune in to a key of experience to which we customarily grow deaf. 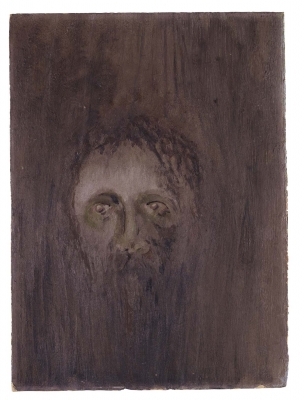 In “listening to himself,” the artist’s aim is to probe the innermost reaches of the self and to translate that which he inwardly hears into a form that we, the onlookers, can outwardly witness. 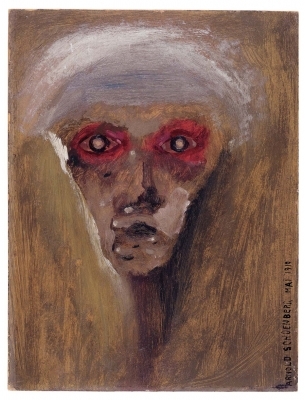 Schoenberg’s paintings stand as glimpses into the creative depths of one of the twentieth century’s great composers: innervisions of a man who strove for art that was decidedly more than meets the eye. ** In a letter of January 24, 1911, A Schoenberg Reader, edited by Joseph Auner (New Haven: Yale University Press, 2003), p. 90-91.